by Dave from The Longest Way Home ~ November 11th, 2011. Published in: Travel blog » Sabah (Malaysian Borneo). Lunch at the Labuk Bay Proboscis monkey sanctuary is a little below par. The prices are higher than Sandakan, as one would expect at a resort. But the food was not near resort quality. Not that I know much about resort quality food. But this was a little bland, a little cold, and the orders often mixed up. This was however all countered by some great staff, educational facilitation and lots of information. The staff at Labuk bay were exceptionally friendly. From bus and boat drivers, to guides, waiters, and kitchen staff. They seemed well-informed about everything in the area. Many of the ladies wear traditional dazzling silky kampong dresses. Not for any sort of “cultural dance” or the like, but just as part of their normal everyday attire. Omar the bus driver should also be commended for going above and beyond the call of duty on many an occasion. Including when I left the cover of my phone by a seat. He kept it safe, and made a telephone call to locate me and get the cover back. RSS & Email subscribers, there is a video inserted here of Proboscis Monkeys from Borneo, please click here to view it. Small things like this added to this “resort”, and my reluctance to leave. A ranger began squawking out to the trees in an attempt to attract the monkeys for their own lunch. A few young females appeared in the grass as a Egoret gulped down a fish. It was all so much better without the human element around. The trees up above crashed to the sounds of an Alpha male arriving for some sugar-free pancakes that the rangers had ready. The ranger handed out pieces of pancake from the walkway and slowly the Alpha male accepted them. It was here I learned that the proboscis monkeys have a very unusual diet. The proboscis monkeys main diet consists of young leaves, dry starchy fruits, and seeds. 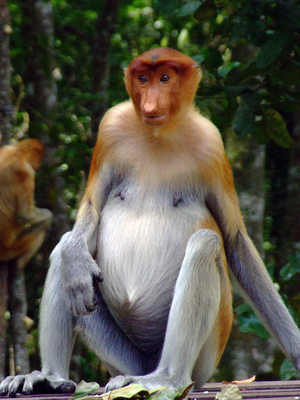 The food the proboscis monkeys eats sits and ferments in their stomachs. Hence, they have such big protruding stomachs! Still chewing and with a powerful saunter the male proboscis monkey walked over to me and firmly grasped my pancake offering. Our hands touched and I felt the cold calluses of a well toughened hand. Not something you expect from such a “cute” little monkey. And an all too real reminder, that these are indeed wild creatures. I stood under the main feeding platform with a ranger and we looked on at the family above as they seemed to be showing some form of evolutionary sense. That is until the mother uttered the words. 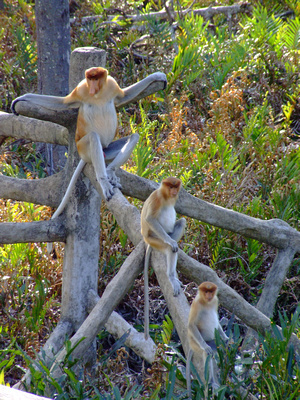 At least here the rangers, or guards, were well on the look-out for the well-being of the Proboscis monkeys. They also took the time to explain to the family why they should not use flash. I don’t know if I’d have the patience to do that as often as they have to. The Alpha male next to us looked at us in the eye, then to our empty hands. Snorted. Swung down to the walkway, and sauntered off. We were of no more use to him. After a quick groom, he once again engaged in expanding his DNA reach with his many wives. While not as ‘overwhelmingly grand’ as visiting the Orangutans at Sepilok, the Labuk bay sanctuary seemed to have a far better administration. There’s also an option to stay there, where dorm rooms and privates are easily available. For me, it offered that rare type of place. It’s away from the city, but close enough to get back to in a morning. It’s not overcrowded. The staff are nice. And, you can avoid the day tripping tourist crowds by staying there. The longer I stay in a place like this, the more attached I get to it. It’s not perfect, but then few places are. Home it is not, a temporary abode, it sure can be. 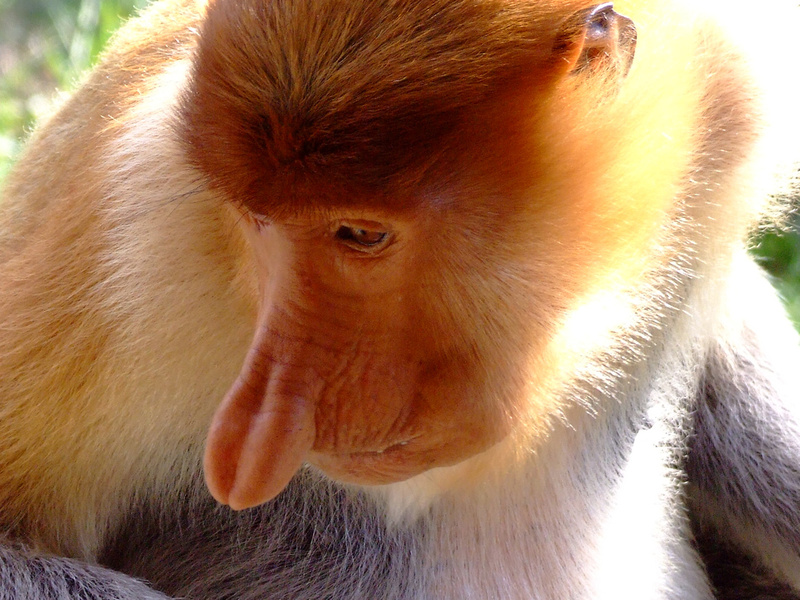 I learned more about the Proboscis monkey here than I have anywhere else. More to the point, I found myself putting my camera down and enjoying a hands on learning experience about ecology as a whole. Something I never quite enjoyed as much anywhere else before. I’m only guessing, but I think that must mean they are doing something right. And, I wonder how many other places are there like this in the world? i like this article. I really do..
I’m doomed no matter what I say here, aren’t I? :) ha ha. Whatsup with their noses anyway? Why are they shaped like that, to sniff out food? For the males, a large nose attracts a female according to researchers. For the female … well, I guess it must be something similar! Incredible looking monkeys. Do they come up to your cabin? We had that happen in Kenya a few years ago. Monkeys would come right up to the door trying to get in! No, they are not located near any accommodation in Labuk Bay. But yes, in West Africa I had lots of Baboons try to visit me in a cabin! Awesome post. great looking monkeys out there. They look very innocent, very simple yet the complexity of their being is there. Yes, they look simple. But as you say they are complex creatures. Right from the way from having a unique way of digesting food. To how they attract mates. Thanks for your kind words Luke. Another post with wild animals! (… and …another endangered one,but yes, that’s the way it is, hum …) Can you explain why they are feeding them pancakes? and what ingredients are in the pancakes? is it like a candy for them? These apes eat primarily, fruit, leaves, flowers, seeds and insects, don’t they? Thanks so much for sharing, Dave !! Hi Ivy, sorry for the delay in answering you! Yes, the probosics monkeys eat pancakes. They have a really unusual digestive system for primates and so have a fairly unique diet. Their stomachs are actually divided into compartments filled with cellulose digesting bacteria. These bacteria help digest all leaves and neutralize toxins in found in certain leaves. This giant “fermenting” type of digestion is why their stomachs make up one quarter of their body weight. And, this is they have such prominent, pregnant looking stomachs. Their diet usually consists of starchy foods, young leaves, seeds, flowers, and some vegetables. The pancakes are sugarless, and high in wheat and rice flour. So yes, it’s like a healthy candy for them! Minus the sweetness! 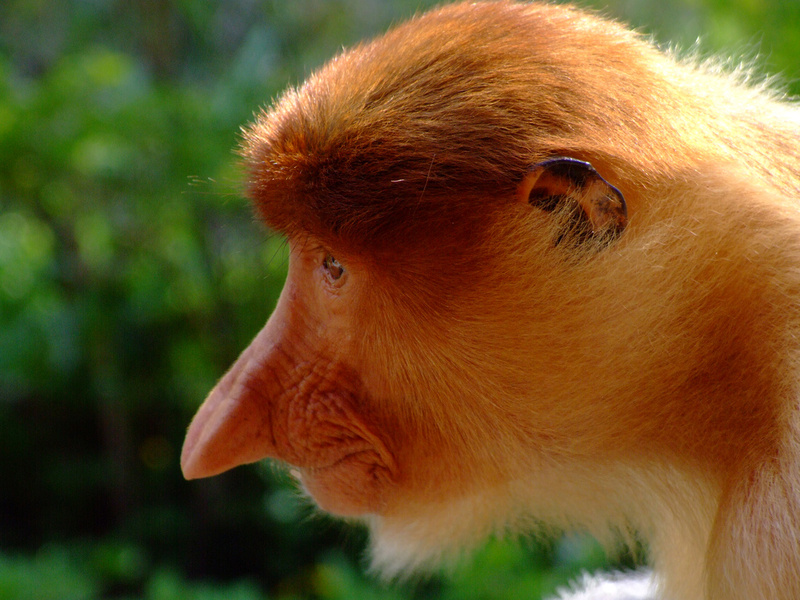 Here’s a link to study that provide details in the Proboscis Monkeys diet. Another fabulous encounter with wild primates. It’s so heartening to hear about places like this that really care about the wildlife, and informing ignorant tourists. The latter requiring oodles of patience, as you say. Great photos! Thanks Victoria, glad you like the photos. I’ve always had a high regard for wildlife. Not sure why others don’t get it. I’m guessing education. Either way, I just put all my thoughts together regarding Borneo, and an large opinion piece on how to save the world’s wildlife. Not sure if you agree, or if you’ve come across a better idea? Anyway, the post is below. Great place, ranks among my Sabah Top 3. Sounds like things changed since 2009 though. Then there was no lunch and overnight stay possible.